Grilled cubes of tender chicken, slices of tomatoes and lettuce. Served in a heated pita bread pocket. Grilled strips of tender chicken, slices of tomatoes and lettuce. Served in a heated pita bread pocket. Grilled minced lamb seasoned with special spices. Served in a heated pita bread pocket. Grilled ground beef with onions, parsley and spices. 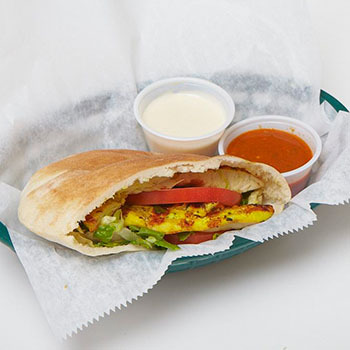 Served in a heated pita bread pocket. Ground chick peas, vegetables and spices shaped into tasty patties and deep fried to a flavorful crispiness. 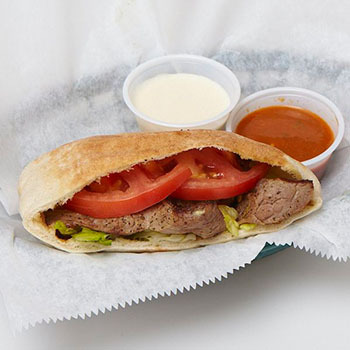 Served in a heated pita bread pocket with special sauce. Sliced turkey meat marinated and seasoned with our special spices. Stacked and skewer. Then slowly cooked on revolving rotisseries. Served in a heated pita bread pocket. 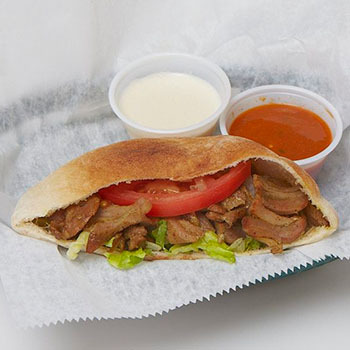 Sliced chicken meat marinated and seasoned with our special spices. Stacked and skewer. Then slowly cooked on revolving rotisseries. Served in a heated pita bread pocket. Thin slices of rotisserie cooked beef. 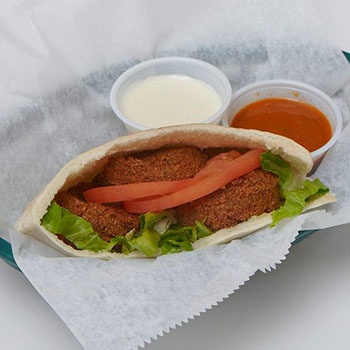 Served with tomatoes and lettuce in a heated pita bread pocket. 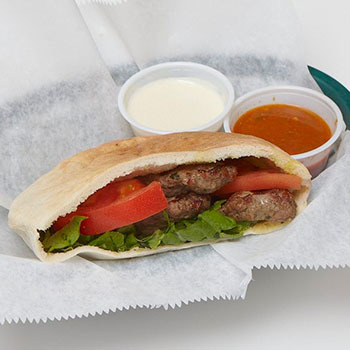 A burger made from fresh ground lean sirloin beef with lettuce and tomatoes in a heated pita bread pocket. Served with your choice of trench fries or rice pilaf.